"The three ingredients that go into this appetizer will fill your kitchen with an irresistible aroma that draws friends and family from all corners of the house. 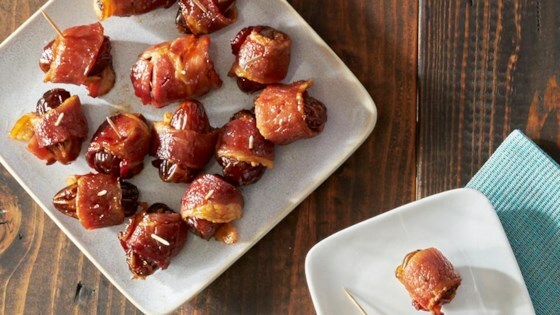 Sweet dates and crunchy smoked almonds get wrapped in salty smoked bacon. Maybe you should make two recipes." Preheat oven to 400 degrees F. Cut a slit in each date. Place almonds inside slits. Press together the dates to close slits. Wrap each date with a piece of bacon. Line a shallow baking pan with Reynolds Wrap(R) Aluminum Foil. Add a roasting rack; place the dates on rack. Roast for 15 to 20 minutes or until bacon is crisp. Serve immediately with toothpicks. Dates will be hot inside. Aluminum foil is a must for roasting the appetizer. It collects any drippings from the bacon for a quick cleanup at the end. To line the pan fast, turn pan upside down and press sheet of aluminum foil around it. With aluminum foil, you can use either shiny side up or dull side up. Remove the aluminum foil. Turn over; drop foil inside. Crimp edges and you're ready to cook. Amazing! Rave reviews! Made it for my gluten free family & it was a big hit! Cooking time was more like 35 minutes. Quick and easy. This is not something I would have chosen to prepare if I had not had them at a party. They are deliciously addictive! Just the right taste of smoke and sweet. Everyone loved these. We cooked on the bbq, which was a bit hard to control butI don’t like to smell in the house for a party.